Remember I introduced Auravedic, a budget Ayurvedic brand, on the blog a while back ?? I introduced you to the brand mid of April and started using the products a week or two after that! Yeah, I know I can be tremendously lazy ! So, after using the products for almost 5 weeks I would be reviewing these, starting with my personal favourite; the Ritual Skin Lightening Mask, Auravedic Bridal Haldi , a turmeric paste with sandal and saffron. This is a part of the " Bridal Haldi Ritual Secrets " from Auravedic and has 4 other products in the range . It is FREE OF parabens, colorants, animal by-products and cosmetic chemicals. I have always said that I am not a big fan of whitening products but I did not have single problem in trying this out because this is not a whitening product and we all know that Haldi (Turmeric) has natural skin lightening and brightening properties! Now let’s see how this worked out for me! I liked the simple white tub packaging. The mask comes with a seal which I like, because I have seen many big companies not keeping this in mind. I would have loved it even more if this came in a tube instead of tub packaging. The product smells of Haldi and those who like the smell of typical Ayurvedic products , will absolutely love the fragrance! I am so in love with the fragrance that I used to apply this only to smell it for a long time! 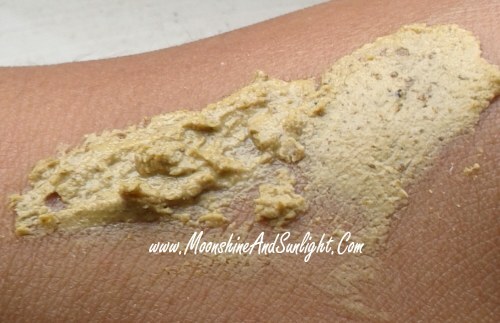 It is a thick paste but do keep in mind to mix it up with the little bit of liquid in the tub or else it will dry out when you have a little bit left. I used up the liquid and am left with the thick dry paste! So, avoid doing what I did! I love the effect this has. But, do not keep this on for a very long time! It can dry out the skin if it gets very dry (well, that’s the case with most face masks!). It never broke me out, until recently I had it on my face through one whole episode of Game of thrones! It was bound to happen! Hehe! They recommend keeping it for 30 minutes and you can do that, but don’t keep it for longer than that. I will give this 8 out of 10 because this is something totally worth the money and suits my combination skin. This would be perfect on oily skin as it keeps oil at bay for a really long time! Do you know about any budget ayurvedic face mask that works?? Do let me know in the comments !